This year, PokeStats has been creating Deck Power Rankings prior to every major event with the help of some of the game's top-rated players. 13 players helped out with our Vancouver rankings - a smaller group than usual, but expected given that not many of the top players actually attended Vancouver, which was a pretty small Regional. 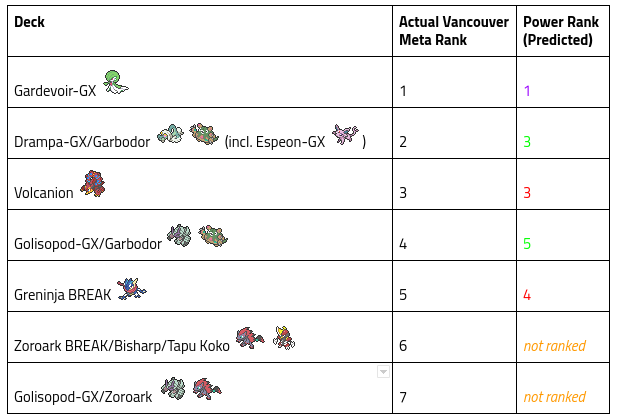 I decided to take a look back at those rankings and see just how accurate they were in predicting Vancouver's meta, so without further ado, let's get into it. 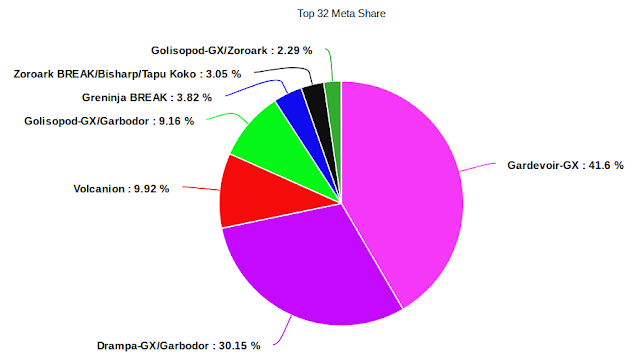 A short ways behind it is Drampa-GX/Garbodor (which a lot of players added Espeon-GX into in Vancouver), and following that are Golisopod-GX/Garbodor and Volcanion. Lower-tier decks that still saw success: Greninja BREAK and miscellaneous Golisopod-GX variants. There was one notable rogue in Top 32 in Vancouver: Alex Koch's Zoroark BREAK/Bisharp STS/Tapu Koko, which attempted to destroy Gardevoir-GX while having a decent matchup against most other decks (seems like it worked pretty well). Anyone interested in Koch's list can find it on Limitless here. Koch's Zoroark/Bisharp and Aaron Tarbell's Golisopod-GX/Bisharp were both pet decks and there was no reason to expect them to appear on the pre-Regional rankings. The rest of that chart is about as accurate as you can be without being 100% correct: just switch a couple decks and you'd have the perfect picture. BRT-BSH is now an obsolete format, as this coming weekend's Cups feature the brand-new Shining Legends set. I doubt many players will remember BRT-BSH fondly, as the lack of diversity, oppressiveness of Gardevoir-GX, and the fact that the Vancouver meta was almost exactly predicted the week before, show that it is a pretty "closed" format. I'll try to have some insight into BRT-SHL published here on PokeStats in the next few days for those of you competing in Cups this weekend, whether that insight is statistical or more subjective (I might pick the brains of my Power Panel while they're taking a break between this past Regional stretch and London Intercontinentals). We'll see if anything might be poised to tip Gardevoir off its lofty perch, and any other surprises Shining Legends might drum up. In the meantime, keep checking back for updates sitewide: new features such as Meta Progression Charts, and updates to event data from past seasons. Stay tuned, and thanks for reading and supporting PokeStats! Very interesting stuff here. Your predictions being so accurate is a strong testament to the usefulness of this site.